Back in the good old days, a nickel used to buy you a night on the town with your best gal, including a trolley ride, tickets to the latest Clark Gable film and the post-coital pack of cigarettes. Now it doesn't even cover 15 minutes in a downtown parking meter. How did this change over time? It's all part of the magical and mysterious phenomenon called inflation. Let's learn about it! Unless you're some kind of idiot, you know that inflation is the gradual lessening of the value of money over time. I have kind of a weird obsession with inflation, especially how it relates to car prices. In the 1960s, a car only cost a few thousand dollars; modern cars are astronomically expensive by comparison. So I decided to look at how much some of our favorite cars cost around the time they were introduced and compare them to their modern equivalents, while solving for inflation using the U.S. Bureau of Labor Statistics' handy inflation calculator. New prices were found on manufacturers' websites; old MSRPs were located on the NADA's Classic Car Guide or other websites. 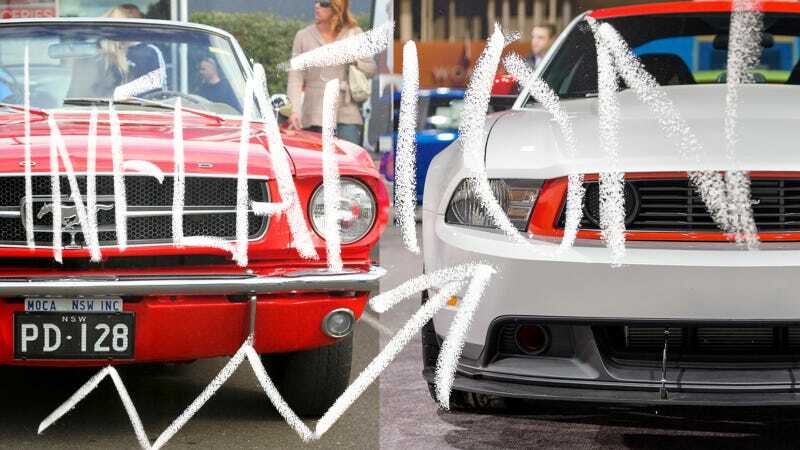 Now, is this an apples-to-apples comparison of cars from then and now? No it's not. Some of these cars have changed a bit over time, dramatically so in some cases. I tried to keep older models as close to their modern versions as possible. It's also fun to highlight how different some of them are today. And there's no question that cars are more well-equipped today than they were decades ago. Engines are better, transmissions are better, safety is better, manufacturing techniques are better, and cars have optional features that people in the 50s, 60s and 70s would have considered science fiction. I thought this would be a good tool to see whether cars have stayed in their original price ranges or whether they've blossomed into another segment. It also shows you how much more of a car you're getting when you buy a new one — although I know that not all of you would consider back-up cameras and lane departure warning systems to be a move in the right direction. So without further ado, click through the gallery to see how car prices have changed over time. Feel free to let us know the price changes on some of your favorite cars as well. Then tell us what you think: are buyers really getting more for their money these days, or would you prefer the older versions of these cars to the new ones? Whoa, 911! You may be a sports car icon, but you sure have ballooned up in price (not to mention weight, size, power and luxury features) since you hit U.S. shores in 1965. The cost of a 911 today — and a base model Carrera at that, not a fancy "S" or Turbo model — is nearly double what it was in the 60s. Congrats, Mustang. You've done a decent job of staying within your price range over the years. I must note that the above prices are for the original six-cylinder Mustang and the current V6. Exact prices for the V8 model were a little harder to track down, but I've seen them around $3,000, which would put them at $22,000 today. The current Mustang GT starts at about $30,000, so while it's gone up a decent amount, it's still arguably in that bargain range. Well, here's something interesting. Of all the cars on this list, none have changed as much as the Beetle. The original was an air-cooled, rear-engine, rear-wheel-drive bargain machine designed to be an affordable "people's car." Today, the engine and transmission are in the front, and the car is essentially a gussied-up Golf with retro styling. Their price difference came in around $7,000, which is quite a bit for someone looking for inexpensive transportation. A base-model version of the new Beetle remains affordable, though. Camry, you just went up a few points in my book. Not only have you managed to stay very close to your original price, you've actually gone down a bit since the Reagan era. Not too shabby! Say what you want about Camrys being giant snoozemobiles (they are), but this is impressive considering how much bigger, more powerful, and more well-appointed the new ones are. While the first BMW 3-Series came out in the 1970s with the E21, I thought I'd go with everyone's favorite car the E30 instead. For this comparison I used the cost of a six-cylinder 325e coupe vs. its modern equivalent, the 335i. No coupe version of that car exists yet, but you get the idea; the 3-Series has not only stuck pretty close to its original price, it's even become a bit cheaper. That doesn't mean it can't get mighty expensive, as we saw when we tested it this week. Once again, the luxury car companies are blowing it up. The new XJ sedan may be far sleeker than its stodgy (but classy) predecessors, but it comes with a much bigger price tag as well. However, the difference in equipment between the two cars is nearly night and day, so perhaps it's justified. The original Z was a small, lightweight, affordable sports car with decent power, and the current one has moved into a different range with a much bigger engine — and more heft. But out of all the cars on this list, none of them have been more all over the price charts than the Z. Consider that the 300ZX Twin Turbo cost $35,890 in 1992, which would be a staggering $59,195 today. Jiminy Jillickers, that's a lot for a Z, even if it is one of the better sports cars of the 90s.